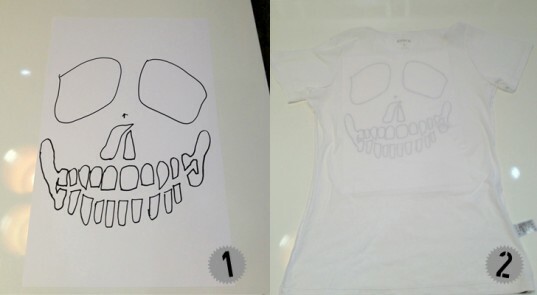 The instructions for this DIY skull t-shirt (found at the Hurley blog via Notcot) weren't intended for kids. But it's the week before Halloween, and kids love to dress-up not only on Halloween, but in the days leading up to it as well. You can scare up this spooky skull tee in a flash. All it takes is an 8x10 piece of paper, some tracing skills and a pair of fabric scissors. No need to go all the way with the pair of skinny jeans suggested... unless of course you're making your own matching tee. 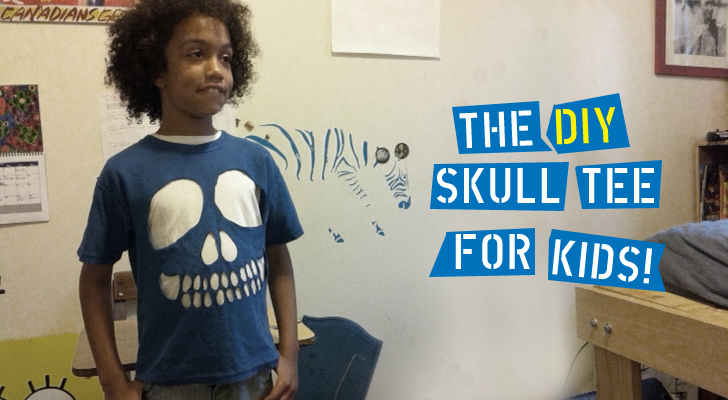 Following the very simple instructions for creating a DIY Cut-out Skull kids t-shirt, (depicted in the pictorial here) I used one of my son’s old graphic tees, turning the t-shirt inside out in order to distract lees from the skull image. Sketching a visual copy from an illustration I found via Google and cutting out the silhouetted form took me about 45 minutes. I found it easiest to pinch and cut a hole in the center of the shapes I wanted to remove and then work outward from there. It proved to be a quick, fun, pleasing project that even a novice like myself could complete successfully. And when the climes cool, and my son refuses to give up this tee, I’ll simply throw it over another, warmer, shirt and he will be able to rock it through the winter. 1) Use a washable marker because it’s difficult to cut the outline perfectly. 2) Draw the teeth as large as possible (tiny teeth equal tiny holes to cut). 3) If you’re advanced and possess a serger, stitching around the holes will make the tee more durable. 4) Also, if you cut the holes neatly you can stitch the pieces removed to another shirt. Following the very simple instructions (depicted in the pictorial here) I used one of my son's old graphic tees, turning the t-shirt inside out in order to distract lees from the skull image. Sketching a visual copy from an illustration I found via Google and cutting out the silhouetted form took me about 45 minutes. I found it easiest to pinch and cut a hole in the center of the shapes I wanted to remove and then work outward from there. It proved to be a quick, fun, pleasing project that even a novice like myself could complete successfully. And when the climes cool, and my son refuses to give up this tee, I'll simply throw it over another, warmer, shirt and he will be able to rock it through the winter. TIPS (learn from my mistakes): 1) Use a washable marker because it's difficult to cut the outline perfectly. 2) Draw the teeth as large as possible (tiny teeth equal tiny holes to cut). 3) If you're advanced and possess a serger, stitching around the holes will make the tee more durable. 4) Also, if you cut the holes neatly you can stitch the pieces removed to another shirt.